If you know me at all, you know I LOVE cupcakes! and I’m obsessed with anything cupcake! 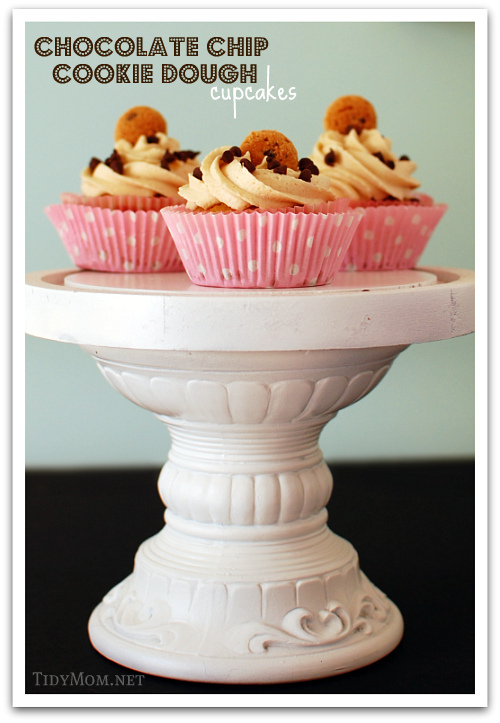 Especially cupcake stands, and right now I’m lovin’ all of the tutorials I’m finding on making your own cupcake stand. 2. Modern Moments Designs – super cute mini cupcake stands with super-duper-quick-and-easy instructions so you can learn how to make them too! 4. Joy’s Hope – A rainbow of Dollar Tree goodness! These are not food safe, but would be perfect for cupcakes in cupcake liners, doilies or scrapbook papers underneath the food. 5. Tatertots and Jello – Use white plates and a glass candlestick from the Dollar Store, then stencil and paint using Plaid’s Enamel Paint then bake in oven to set paint. 6. Creative Abubot – Whether for fake cupcakes or real cupcakes, these plastic pedestals are perfect to display them! 7. 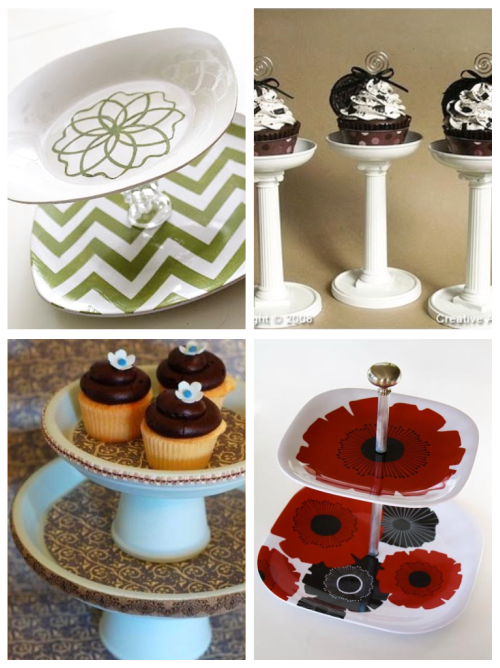 Once Wed – A stack-able cake or cupcake stand made out of basic terracotta plates and saucers. 8. Skip to My Lou – An easy way to make a tiered serving tray that can easily be interchanged with different plastic plates and bowls. Raise life’s celebrations to new heights and put a cupcake on it! So creative! I could have used some of these ideas a few weeks ago for my son’s birthday party. Last week someone asked my 14yo daughter what she wants to be when she grows up and she said with a total straight face, “Own a Cupcake Bakery.” Maybe we’ve been watching too many cupcake shows lately:) Saturday she and her friend are setting up a cupcake stand at our community yard sale. Can’t wait to see how it turns out! Might just have to whip up a cupcake stand or two for her. Thanks for hosting! My daughter did it! She actually pulled off a fabulous cupcake stand (the for sale type not the holds cupcakes type)! I linked up my post about it. Thanks again. Love your blog! 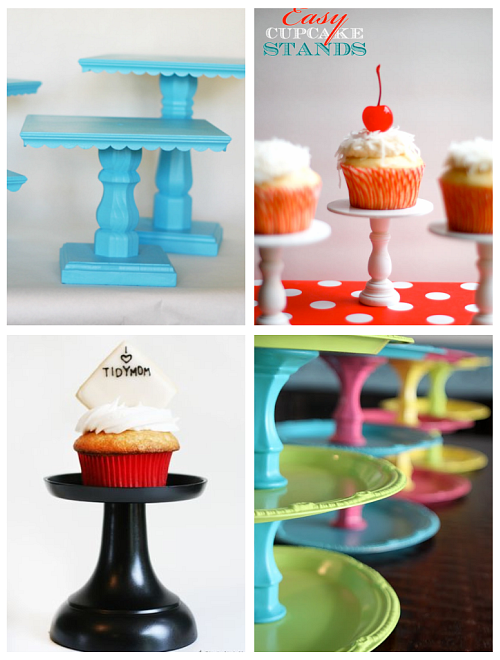 Thank you so much for posting my DIY cupcake stands!! I really appreciate it! Your blog is amazing! I am going to start following!! This makes me want to go fleamarketing for cupcake tower materials! Love all these ideas! Awesome cupcake stands! I’m going to be trying out your cupcake recipe for my sister’s birthday next week. I hope they come out ok. Yours are always so cute! I just bought the components to make cupcake stands, now I just need the spray paint. Thanks always for all the inspiration and the great linky party! such good ideas! i love cupcakes too. thanks for the party. i just noticed this is your #52nd!!! um, that’s a year, sister!!! wow. amazing. Oh, what fun cupcake stands. I love them!!! Thanks for including mine in with those amazing ideas!!!! what a great idea, making your own stands!! I’ve shopped for them, but the ones I like are too expensive! Thanks for hosting. 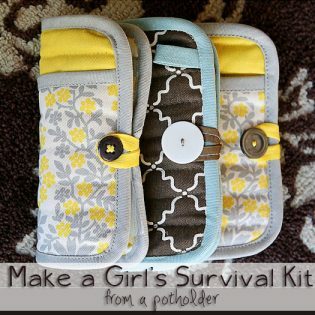 Thank you for hosting a linky party! Have a great weekend! I’m loving all the cupcake stands! Here is a link to the Dollar Store Cupcake Stands I made last summer!! Those cupcake stands are adorable. I love the idea of them. These are very neat ideas! Thanks for sharing them! Great ideas here at your party! Happy Spring and thanks for hosting! Cheryl! Thank you for all of those cup cake holder ideas! Gosh I love every single one of them!!! 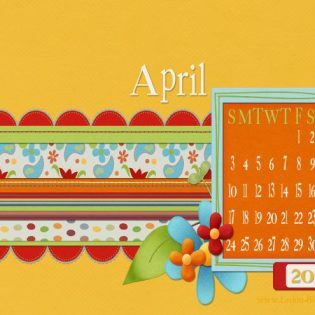 Great post and your links have me clicking away…I’m tweeting and stumbling ’cause of the ah-mazing spring/Easter inspiration! What adorable little CUPCAKE stands! Just can’t get over how CREATIVE girls in the blog~world are! This is a HAPPY post! You make me HAPPY sweet Friend! Have a HAPPY weekend…and ENJOY a cupcake! Hugs and HAPPY to you! Just found your blog, added you to my reader. I also linked up an awesome Southwestern Cobb Salad and some great Cobb salad making tips. So many cute cake plates. What a fun post. Have a great day. so creative. i love how some turned something thrifty into beautiful. i want to go out and give it a try now. fantastic! thanks for putting this together. I love cupcakes. They’d better not ever go away either! These stands are great. Stop by and follow when you have a chance. 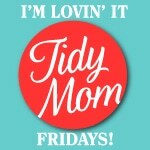 You’ll see I’m pretty tidy too! And i’ve got some great recipes to share. You totally read my mind with this one!!!! These are too cute!! I’ve actually been working on a few with tea cup saucers on chandeliers. I just recently found your site and love it! I look forward to being your newest follower! Love all of those DIY cupcake stand ideas! I made one for my brother’s wedding cake/cupcakes, but have never bothered to make one for myself… I need to do that. Oh . M . Gee…………. I have finally found a girl after my own heart!! a-partner in crime, perhaps… errr scuse me, I mean in Cupcakes! – lol. The reason I even started a blog, was to have it be about delish lil’ cuppies. and now to find this blog post on cupcake stands (which can be outrageously expensive to purchase). well suffice it to say –> I Am in ‘HEAVEN’………. Thank-you, thank-you & THANK-YOU for posting all these totally, completely AWESOME examples, pics, tutorials and LINKS! !